If you love to take your dog on holiday with you, then it can be both difficult and time consuming to find that perfect place. 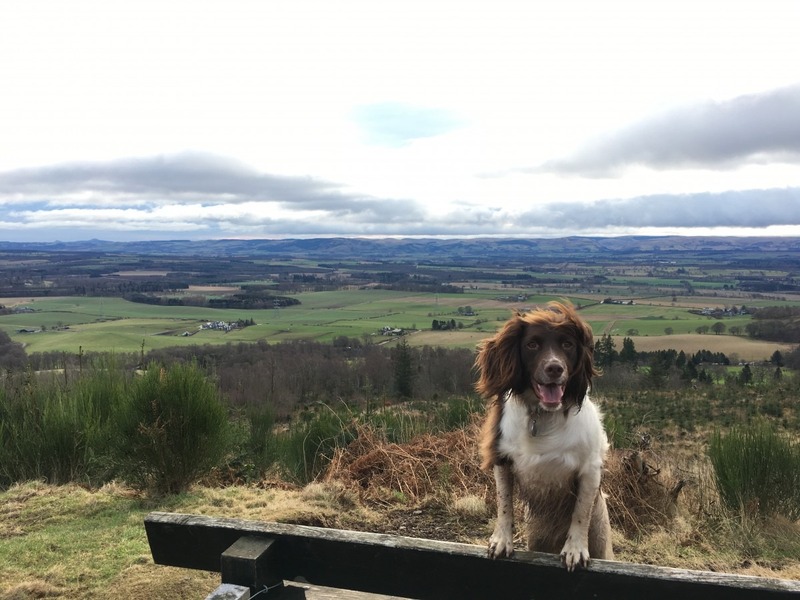 Having just recently moved back into the area I’ve been keen to get out and explore what there is to offer across Scotland and quickly booked my first dog-friendly holiday. The location – Loch Monzievaird. After a busy few weeks and the chaos of Christmas festivities, I packed up the car and got ready to head off over to Loch Monzievaird just outside of Crieff in Perthshire. At just over an hour away from home, it was far enough away to feel like a break but close enough to not need a day to recover from the travel. One additional bag filled with Hogmanay cheer and a second packed full of lots of dog food and treats) and I’m prepared! We are officially off and ready to test the lodges on our first dog-friendly holiday in Perthshire. 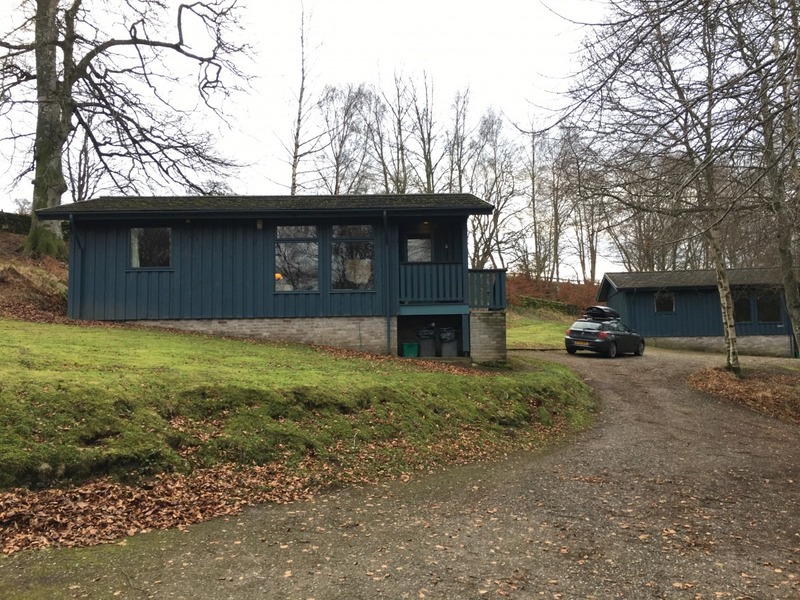 Having checked Airbnb and queried some other lodges, I stumbled across the website for Loch Monzievaird. They aren’t listed on Airbnb or booking.com but do keep their Facebook page and website up to date with availability and offers. There is a great site map online so you can see the layout of the lodges on offer and you can also look at each individual design too. Fab for helping decide which to book! I wasn’t quite sure about the different prices so gave them a quick call. They were more than helpful and loved the cheerful style of the person I spoke to. A few minutes later, I was given some advice, booked in and an email had landed in my inbox. This included the booking confirmation itself but also guidance for dog owners while on site. They even mentioned that I could book in earlier as the lodge would be cleaned previously. This was a huge bonus as we could arrive a little earlier and get out for a walk with Millie before it got too dark. Oh, and I could pre-order a delivery too. Several large supermarkets deliver directly to the lodge. I booked this a few days ahead and meant that the first day was pain-free and could maximise the time at the lodge. The website is full of helpful information including terms and conditions through to local walks, making planning for the week so much easier. As you drive into the resort, you’ll find a reception lodge on the left-hand side where you can collect keys. Again, the welcome was warm and helpful. With several lodges available for up to 8 people, I’d opted for a Pine Lodge. Why? Well there were two smaller lodges available but this one on looked a tiny little bit closer to the Loch and it had a sauna. However, having now been on the site itself, I wouldn’t worry about how close it is to the Loch. They all have fantastic views and plenty of space for parking either right at the lodge or a few steps themselves. I’m not sure if it was luck but my lodge, number 22, was named Jane. Jane was my gran’s name and is my own middle name. I was clearly in for a good week! I was a little concerned however when I spotted that the lodge backed onto the main road. As someone who lives out in the country with a field as a back garden, while the area, was secure for Millie, I was a little worried about noise. I needn’t have been as I really didn’t notice it too much during my time in the lodge. I would however perhaps forgo the sauna for one of the other lodges on the opposite side of the loch with decking areas integrated into the lodge. I also loved that all 24 lodges were spaced out so well. It didn’t feel like you were peering out the windows and directly into your neighbours. Along with the sauna, which was welcomed after long walks outdoors, there were two good sized bedrooms with plenty of storage. The living room, kitchen and dining were all open plan making best use of a small space. I must admit that when I first walked in, it felt small. However, there really was no need to be concerned. With a separate entrance for boots, coats, wellies and tennis balls for Millie, the owners have really thought through the layout and contents. It was comfortable, warm and we soon settled in. The lodge was also filled to the brim with everything you’d need for a self-catering holiday. Lots of pans, cooking utensils, bottle openers, mugs, cups, wine glasses, port glasses and that all import coffee cafeteire! Perfect if you plan to do a lot of cooking in the lodge itself. You’ll also find the lodge stocked with some dishwasher tablets, tea towels, cleaning cloth and materials. There was also toilet roll and some welcome sachets of tea, coffee, sugar etc. to tide you over until you’ve had a chance to go shopping or have it delivered. Oh, and how could I forget the little dog leaflet with guidance with a poo bag and treat for Millie too! While I didn’t make use of them, given the winter visit, there are also BBQ facilities and outdoor seating with every lodge. Perfect for slightly warmer visits. You are asked to put the bins into those provided outdoors and at the end of the week, you are asked to hoover and strip the beds, placing the linen into a washing bag. I personally had no issue with doing so, particularly given the standard and cleanliness of the lodge upon arrival. Outdoor BBQ and seating. Note that some Lodges have a decking area. Wifi available (note that this isn’t a great signal and thus don’t expect to watch films etc. via wifi – ok for light use at certain times). and most important – Dog-Friendly (though four lodges are pet-free). Loch Monzievaird is a beautiful Highland estate set in a historic designed landscape. The grounds are protected by Historic Scotland and extend to 40 acres. As if you hadn’t guessed but the most amazing part of the holiday was Loch Monzievaird itself. 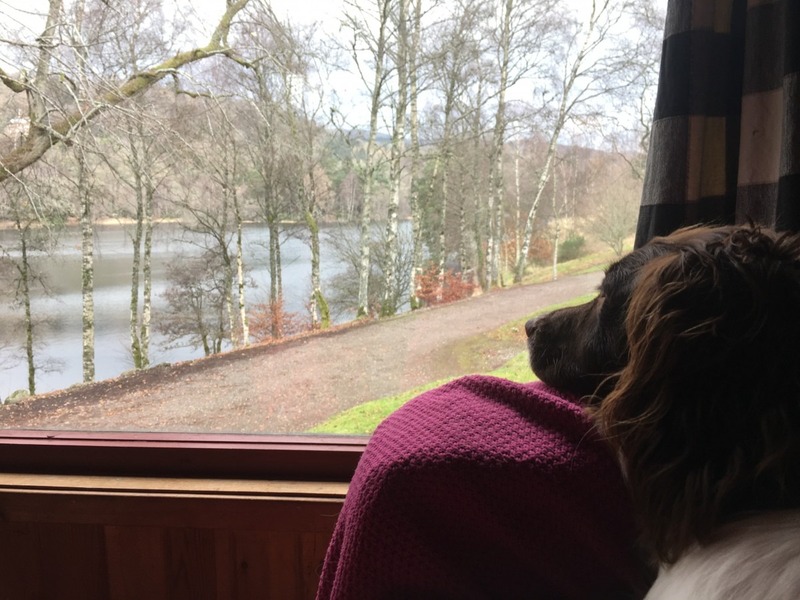 You really can’t beat the views of the Loch from every window of the lodge. There was something so therapeutic about watching the Loch change over the course of a day. It really is such a stunning walk on your doorstep and access is restricted to those staying on the site. 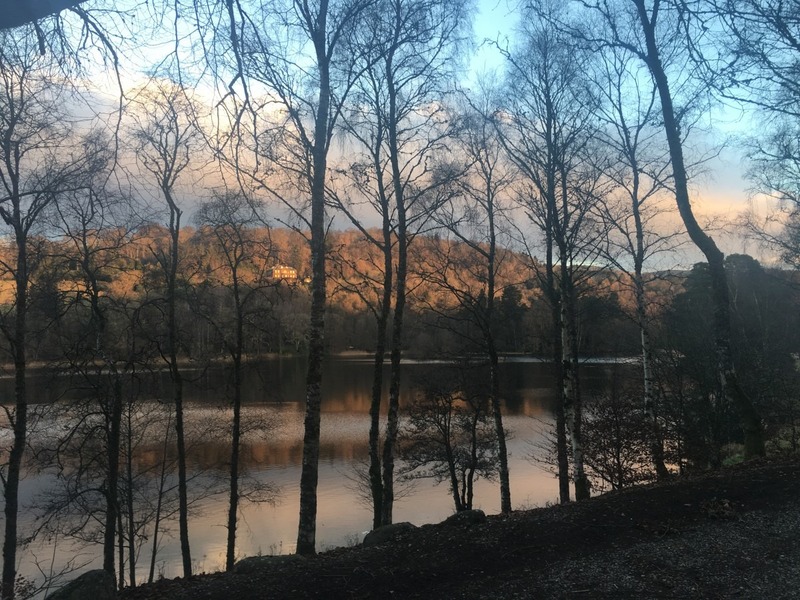 You’ll find a gentle circular walk around the Loch with lots of open space on the south side and the north side flanked by more woodland and shrubbery. While it would take only 30 minutes or so to walk around at a gentle pace, I found the first few walks were around an hour. One too many places to take photographs! No matter how often we took a walk around, there was always something new to spot. 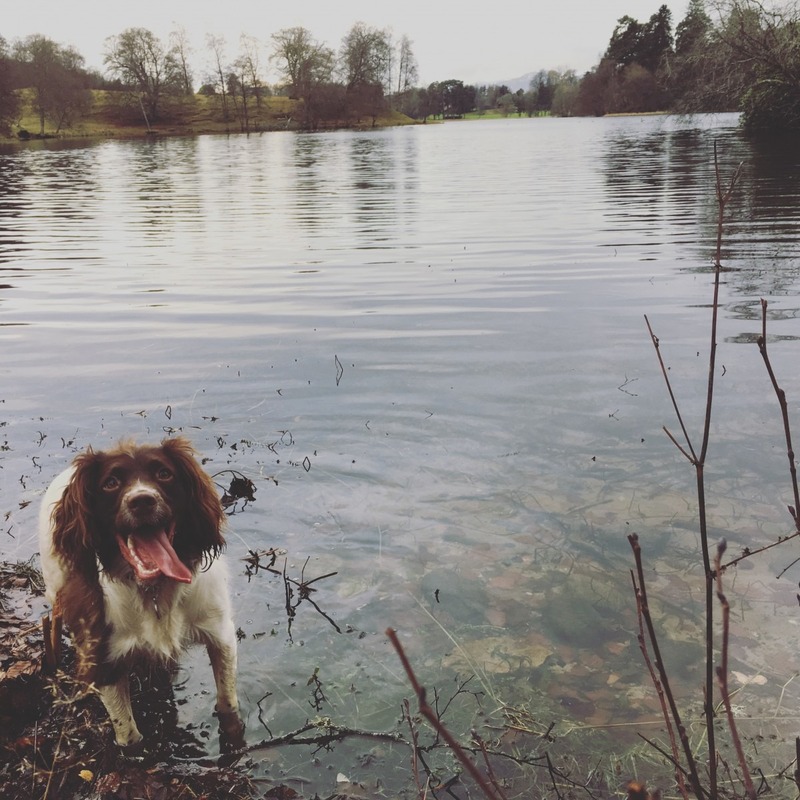 With the weather still mild, Millie often treated herself to a little swim and with the additional open space, we had lots of opportunities to play her favourite game fetch. It was helpful to have this right at the door as it helped vary her walks throughout the week. Note that one section of the circular walk was a little muddy due to the time of year so do, take those wellington boots. You will also need to use a stile to pass over a gate if you wish to do the full circular walk. If you are coming from further afield, you’ll find Edinburgh and Glasgow all within an hour’s drive. Just two miles from Crieff, it’s a fab location to use as a base. You can head up to Highland Perthshire or there is lots to do along the east or west coast too. However, the most notable attraction is just a few minutes’ drive away – The Famous Grouse Experience. During peak times, you may wish to pre-book before you arrive and remember to bring your doggy crate. Crieff is just a few minutes away with bars, restaurants and a fab butchers too. But if you are a dog owner, then you’ll want to know about dog walks! From the walk around the loch to access to a path network opposite the site entrance, you aren’t short of options both close to the lodges and further afield. There are several options if you are looking for longer 2-3 hour walks and it takes just a few minutes until you feel like you are up in the hills with amazing views. My firm favourite over the week was The Knock, a 5-minute drive from Loch Monzievaird and situated just behind the Crieff Hydro Hotel. A great circular 90-minute walk with lots of different terrains for Millie and her need to sniff!! Oh, and of course those great views. Couples, families, and groups of friends will love the ability to make the most of the area. However, solo travelers will enjoy the seclusion and time-out too. While the location and lodge itself are dog-friendly, you will need to take your own dog bowl and bedding. Whilst I visited during Dec/Jan and wasn’t disappointed with the location for a winter break, I can imagine spring and summer are spectacular here. The space and ability to make use of the water activities available would be great fun! You’ll find weekend breaks in the smaller lodges start from around £300, with a week during summer in a larger lodge for 8 people average around £900. Do check the website for details and be very quick for summer bookings as many of the lodges are already fully booked. It is worth mentioning that there was an additional charge for Millie – £5 per night. Make sure your human packs a throw for the sofa and get on their quick! While I should have been sleeping after those long walks, I preferred keeping an eye out for those pesky ducks! You can find availability on the Loch Monzievaird website HERE or call 01764 652586. If you love going on adventures with your dog, you may also want to check out our other reviews of holiday accommodation. We are constantly adding, so do keep an eye out or join our mailing list below to make sure you don’t miss out. I just came across your review of Loch Monzievaird. Thank you so very much for your lovely, kind and brilliant review of us. I can not tell you how happy I am that the little details we have added for the comfort of our guests mean so much to you. To know that your stay here was so very pleasing for you and Millie makes everything we do here so worth it! Thank you again for this wonderful review. It really does mean a lot to not only my husband and myself, as Loch Monzievaird’s managers, but all our staff who work hard to make your stay enjoyable. Wow, incredible blog layout! How long have you been blogging for? you make blogging look easy to cheap nfl jerseys china. The overall look of your website is great, postwholesale nfl jerseyslet alone the content! Hello there, just became alert to your blog through Google, postand found that it’s truly informative cheap nfl jerseys. I gonna watch out for brussels. Il appreciate if you continue this in future. Lots of people will be benefited from your writing. Cheers! I do agree with all of the ideas you’ve presented in your postcheap nfl jerseys. They are very convincing and will definitely work. Still, the posts are very short for novices. Could you please extend them a little from next time? Thanks for the post. hey there and thank you on your information ?I definitely picked up anything new from right here postcheap nike nfl jerseys. I did however expertise a few technical points the use of this site, as I experienced to reload the web site lots of occasions previous to I may just get it to load correctly. I had been considering in case your web host is OK? Not that I am complaining, however sluggish loading cases occasions will often impact your placement in google and can injury your high quality score if ads and ****|advertising|advertising|advertising and *** with Adwords. postcheap nike nfl jerseysWell I including this RSS to my e-mail and can glance out for a lot more of your respective intriguing content. Make sure you replace this again soon. Thanks for the good writeup. It if truth be told used to be a enjoyment account it. Glance complex to far introduced agreeable from you! By the way, how could we keep in touch?